On the trail of a spy ring intent on stealing government radar plans, Charlie Chan, working as a federal agent, enlists the aid of Captain Flynn of the New York City police. Unfortunately, Flynn follows Chan's lead to one of the spies, named Rausch, too closely, causing the spy to be killed by his mysterious boss. 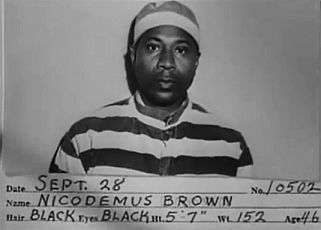 Discovering that the murderer escaped in the stolen car of radio performer Diane Hall, Chan and his two assistants, number three son Tommy and chauffeur Birmingham Brown, go to the Cosmo Radio Center. There, they find a footprint identical to the bloody impression left by the murderer at the scene of the crime. Meanwhile, Ralph Brett, the studio manager, telephones the leader of the spy ring, who uses a Western Union teletype machine to communicate with him. The message warns Brett to be more careful or meet the same fate as the murdered Rausch. Later, Chan goes to the Hamilton Laboratory, which is located in the same building as the radio center. He is told of many unsuccessful attempts to break in and steal the radar plans from the laboratory's safe. Chan then places phony radar plans in the safe in the event that the spies are more successful in the future. After actress Gloria Bayne attempts to blackmail Brett, having found his matches in Diane's recovered car, she is killed suddenly by an unidentified poison. Realizing that Chan may now be onto him, Brett telephones his boss, asking for help in escaping. The instructions that are teletyped to Brett lead him to his death via a service elevator with a trap door. Upon finding the murdered studio manager, Chan has a voice impersonator call the spy leader, who, thinking that Brett is still alive, instructs him to use the service elevator once again. However, as Chan and Tommy step out of the gimmicked elevator, Birmingham suddenly has the floor drop out from beneath him. Holding on for his life and calling out for help, Chan and Tommy rescue him. Chan then questions the people who had worked with Brett and Gloria, but receives no useful information. Later, actor Willie Rand dies suddenly while performing on a live television show. He had just told Chan that he may have uncovered some important information. The detective soon finds, through laboratory analysis, that both Gloria Bayne and Willie Rand had been killed by a poisonous gas that was activated by a reaction to the nicotine inhaled though cigarette smoke. Chan, Tommy, and Birmingham search the building and the spy leader's office is eventually found. The mysterious leader, trying to escape, is killed when the trap door in the service elevatoraccidentally opens. In the basement of the building, Chan and his assistants find the lifeless body of Mrs. Marsh, the ruthless radio sponsor who was also the mysterious leader of the spy ring. NOTES: The working title of this film was Robot Murder. The title card reads: Charlie Chan in "The Scarlet Clue". Hollywood Reporter production charts include Harry Bradley and William Gould in the cast, but their participation in the released film has not been confirmed. Hollywood Reporter production charts also note that director of photography William Sickner was borrowed by Monogram from Universal to work on this film. The minor role of actor "Horace Carlos" is obviously based on film actor Boris Karloff, while the film's killer wears a mask modeled on actor Rondo Hatton. Modern sources add the following actors to the cast: Charles Jordan (Nelson) and Kernan Cripps (Detective). Contents of safe are only secure so long as someone outside watching safe. What detective needs is great patience. Suspect everyone on general principle. So many fish in fish market, even flower smell same. (Tommy: "You know we have to look after you.") You look after me until I'm out of sight. (Tommy: "...no trouble is too big for us.") Some of your trouble too big for me. (Tommy: "Well, I had an idea, but it's gone now.") Possibly could not stand solitary confinement. (Tommy: "When it comes to detective work, I know my Ps and Qs.") But are you familiar with rest of alphabet? (Capt. Flynn: "Hey, it looks like the place has been robbed!") Looks in this case not deceiving. (Mrs. Marsh: "It's an outrage!") Murder also outrage. Somewhat on a better plane than prior attempts by Monogram to capitalize on its Charlie Chan series, "The Scarlet Clue" is a whodunit that should please fans of this type of film fare. Picture actually has suspense, and the well-written script keeps viewers guessing as to the actual murderer. Acting, too, is better than average, probably because main members of the cast have better material than in several previous pix. 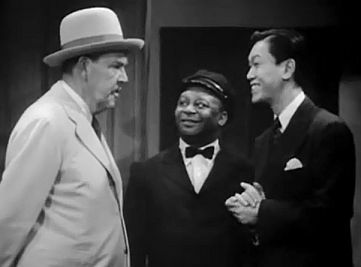 Sidney Toler, as Chan, plods along to a successful solution of the killings with able support from Benson Fong, in the role of his son, and Mantan Moreland, who supplies the comedy relief. Helen Devereaux handles her role capably as do the other supporting actors. Yarn deals with plot to steal radar plans from the Government, causing the death of several people by remote control. Chan and his side center their activities in the radar plant which is also in the building where a radio station is located. Film gathers momentum and the denouement actually catches the viewers off guard. ACCORDING TO CAPT. FLYNN, THE LENGTH OF TIME THAT HE AND HODGE HAD BEEN TRAILING RAUSCH FROM THE TRAIN STATION: "...seven hours." THE FACTS OF RAUSCH'S DEATH, ACCORDING TO CAPT. FLYNN: "Stabbed within the last twenty minutes." ACCORDING TO CHARLIE CHAN THE TYPES OR RESEARCH CARRIED ON AT HAMILTON LABORATORY: "Radar, radio." THE TIME AS DIANE HALL'S CAR WAS NOTED AS MISSING: 8:30 p.m.
A FACT ABOUT THE BLOODY SHOE PRINT FOUND IN THE HALLWAY OF THE COSMO RADIO CENTER, AS NOTED BY CHARLIE CHAN: "Right shoe." Brett: "He (Rausch) was ready to blab because Charlie Chan was after him, too. But he can't talk now - he's dead." Brett: "I borrowed Diana's car last night to go to meet Rausch." THE NAME GIVEN TO INFORMATION OPERATOR BY RALPH BRETT IN ORDER TO OBTAIN THE ADDRESS CONNECTED WITH THE SPY LEADER'S TELEPHONE NUMBER: "...Inspector Grady, Precinct Station 27." THE INFORMATION ON GLORIA BAYNE, AS READ BY CAPT. FLYNN: "Radio actress, small time, until she made a hit on Mrs. Marsh's program. She used to be a gold digger, but she's a hard worker. No record." THE INFORMATION ON DIANE HALL, AS READ BY CAPT. FLYNN: "Radio actress from legitimate stage, New York. Came here two months ago. Nothing definite on her except that she lives with Gloria Bayne." Brett: "Listen. Gloria Bayne, an actress here, knows that I used Diana Hall's car last night. She's blackmailing me. What'll I do?" Brett: "Listen. Charlie Chan knows all about the Rausch murder. He's after me. You've got to protect me! What do I do?" ACCORDING TO WILLIE RAND, THE LENGTH OF TIME SINCE HE HAD SEEN RALPH BRETT LISTENING TO CHAN'S CONVERSATION THROUGH THE DOOR TO BRETT'S OFFICE: "About twenty minutes ago." FOLLOWING RALPH BRETT'S DISAPPEARENCE, THE LENGTH OF TIME, ACCORDING TO CAPT. FLYNN, SINCE HE WAS LAST SEEN: "...eight hours..."
ACCORDING TO CHARLIE CHAN, THE LOCATION WHERE RALPH BRETT HAD LAST BEEN SEEN ALIVE: "...on second floor of Cosmo Building." THE TIME REMAINING TO "AIR," ACCORDING TO THE TELEVISION DIRECTOR: "We go on in twenty seconds." THE TELEVISION CALL LETTERS AS ANNOUNCED BY THE MASTER OF CERIMONIES: "This is television experimental station WXK9X..."
WILLIE RAND'S TELEVISION ACT, AS INTRODUCED BY THE MASTER OF CEREMONIES: "...presenting ace comedian Willie Rand in his own conception of 'The Dance of the Spirit.'" THE POISON USED TO KILL BOTH GLORIA BAYNE AND WILLIE RAND: A combination of gas in capsules and nicotine in a smoked cigarette. The capsules were broken by a shortwave radio signal. ACCORDING TO THE CORONER, THE FACTS REGARDING THE POISON USED BY THE KILLER: "...alone, either the gas or the cigarette is harmless... The combination of gas and nicotine becomes a poison and kills instantly." ACCORDING TO HERSELF, THE LENGTH OF TIME THAT JANET CARTER, GOVERNMENT INVESTIGATOR, HAD WORKED UNDERCOVER AT THE COSMO RADIO CENTER: "I came here a month ago on Mr. Chan's orders." battle-ax (or battle-axe) - (Slang) A woman held to be antagonistic or overbearing. Willie Rand: "Oh-oh. the battle-ax." blab - To reveal indiscreetly and thoughtlessly. The Scarlet Clue - Ralph Brett: "He was ready to blab." gab - Idle talk; chatter. The Scarlet Clue - Willie Rand: "You, see, I gab a lot." glope - (Informal) A person who gapes in astonishment or fear. Mrs. Marsh: "Learn how to talk like a human instead of a glope..."
gold digger - (Informal) A woman who seeks money and expensive gifts from men. Capt. Flynn: "She used to be a gold digger..."
radar - (1) A method of detecting distant objects and determining their position, velocity, or other characteristics by analysis of very high frequency radio waves reflected from their surfaces. (2) The equipment used in such detection. Hamilton: "All of my radar equipment has been taken away by the government." slave driver - A hard taskmaster; an overbearing employer. The Scarlet Clue - Willie Rand: "He's the slave driver." A Teletype machine was used by the gang leader to communicate with gang members. zoot suit - A man's suit popular during the early 1940s, characterized by full-legged, tight-cuffed trousers and a long coat with wide lapels and heavily padded, wide shoulders. 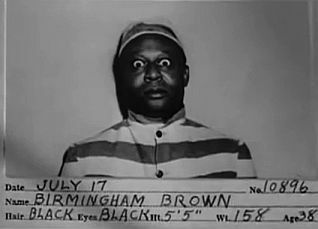 Birmingham Brown: "Look at that zoot suit he's got on."